Are My Hair Extensions Ruined? Why Are My Hair Extensions Dry And Tangled? Hair extensions are a wonderful accessory to provide you with long, luscious locks you desire, but they do need looking after, more so than your natural hair. If left to do their job with no specialist care, you may find that your hair extensions become dry, matted, dull and lifeless. Learn How To Fix Matted Hair Extensions or How To Fix Dry Hair Extensions. It is a common problem that most hair extension lovers will come across at some point with their extensions. Why do they end up like this? Well, they simply don’t get the natural oils that our scalp produces to help protect and condition our natural hair. Hair extensions can also become matted more quickly depending on their quality. Ideally, you’ll want to have real hair as your extensions as these are longer wearing, better for you and won’t matte as quickly. If you choose to have synthetic hair, then these tend to damage quicker, because they have been overly processed. To keep your hair extensions in the best condition possible, and to reduce the amount of knots, and the look of tired dull hair, you’ll have to invest time into looking after them. Are your hair extensions currently looking and feeling dry, lifeless, messy and unhealthy? Do you think it’s time for a new set? Your hair extensions may look as though they’re ‘finished’, but they’re not, all they require is some TLC with a few revival steps. A rejuvenating extensive hair treatment will help even those hair extensions that are extensively damaged. Whether your hair extensions are dry and frizzy, knotty, matted, brittle or anything in between, all is not lost with the use of a Pre Shampoo treatment. Learn How To Fix Matted Hair Extensions. Hard water exposure – This can damage your extensions making them become dry and discoloured. Learn more about Hard Water and Hair Extension Aftercare. Sun exposure – This damages your extensions and is one of the reasons why they can become brittle. Learn more about Protecting Your Hair From The Sun. Chlorine – Great for the swimming pool but not for your extensions, it contributes to your extensions becoming unmanageable. Learn How To Protect Your Hair From The Affects Of Chlorine. Sea water – This can also damage your extensions, the same way both chlorine and hard water does. Learn How Salt Water Affect Your Extensions. These factors affect the quality of both your natural hair and hair extensions. They affect your hair extensions by making them porous, which in turn results in the hair absorbing chemicals when exposed to chlorine, and minerals in the case of hard water/sea water. This will dehydrate the hair and strip the minimal natural oils that it has.They can also strip away colour pigments on blonde extensions meaning you’re left with an orange/brassy tone to your extensions. Learn more about What Causes Colour Changes In Hair Extensions. Revive your hair extensions with our all natural and organic treatment. All qualities, brands and origins of hair extensions will change throughout the period of time you have them fitted to your hair, and obviously with that they can become dry, matted and tangled. But with the right care your hair extensions can be revived, making them soft and manageable, but most importantly looking gorgeous once more, within a few easy steps. To revive your hair extensions, start by giving them a trim. Just like you would your natural hair, your extension also need regular trimming to help retain their quality. As the hair extensions are made from human hair, they too will suffer damage at the tips, because they are the oldest parts of the hair, which is prone to easily break. So we’d therefore recommend chopping around an inch off after having them in for eight to twelve weeks. They will be shorter, but they will be a lot healthier. Learn some Top Tips To Prevent Split Ends. After you have trimmed your extensions, you can start to deeply and nourishingly treat your hair. 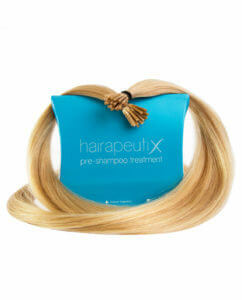 Use one of our Hairapeutix Pre Poo Treatment and fully coat the hair from the mid lengths to the end on DRY HAIR. Why? Well, it will allow the hair to soak up all of those 100% natural ingredients found within it; including Almond, Coconut, Olive, Amla and Avocado oils. We’d recommend leaving the treatment to soak in overnight but if you are short on time then leaving it on for 30-60 minutes will do just fine. We suggest leaving it on for longer so the hair can absorb more of the product for even better results. If you’re reviving a set of clip in hair extensions however, then we would strongly recommend letting the treatment soak in until you next need them. Once you have left the Pre Poo for as long as possible, follow by washing your hair with your normal shampoo and conditioner. As the pre poo is lightweight, it will wash out with ease. If when you rinse it out you feel there is still product left, just shampoo once again. You’ll find that your hair will be softer, healthier, much easier to manage and of course looking immensely desirable. To continue treating your extensions and keep them from become dry, unmanageable and knotted we’d propose that you continue the treatment for an entire month. The Pre Shampoo treatment is available in either a pack of two (£5.99) for a one off recharge, or you can buy a bundle of eight for £18.99, perfect for a month’s use, keeping those extensions in the very best condition. Finally, your hair extensions will be manageable, soft, shiny and damn right beautiful, making every head turn when you walk into a room. Hairapeutix is aimed at helping those who wear human hair extensions by infusing them with natural goodness that they aren’t naturally subject too. The pre-shampoo treatment will not only revive your hair extensions but also protect them too, just like sebum does for your natural hair. Our treatment also works for natural hair too, even though it’s been designed for hair extensions, the natural ingredients inside will do wonders for natural haired lovelies too.